Let’s start with the hero from my newest release. 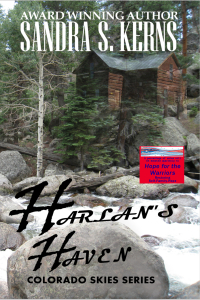 Real or Fictional – Harlan is a fictional character, although he’s very real to me. What should you know about Major Harlan Granger? He is the oldest of four children (2 brothers & 1 sister). He had a great childhood and his parents are still alive. He always wanted to be a soldier and became a Major in the U.S. Army. He spent time in Afghanistan and was recently discharged. That is a fact that bothers him almost as much as the fact he could be paralyzed at any moment. However, his biggest problem is keeping the reason for his discharge a secret now that he’s home. An soldier takes care of others, he doesn’t deal well with pity. Or, he thought that was the biggest problem. It turns out his brother’s neighbor, Rilie is making him remember he’s not a monk. With paralysis hanging over his head, he can’t do anything about it. Can he? Throw in someone causing trouble for his brother’s bar and Rilie, and Harlan’s tension level goes through the roof. All Harlan wants is to repair his parents’ home that was damaged in the flood, save his brother and Rilie, and quietly disappear before the shrapnel in his back ends life as he knows it. If you would like to read more about it, click on this link: CO Skies Excerpts. Harlan’s Haven was released on Veteran’s Day, November 12th, 2014. A portion of all sales will be donated to Hope for the Warriors in honor of all of our veterans. Now, let’s have some fun with another author. I’m tagging a fellow romance writer, Margo Bond Collins. TAG – You’re it, Margo! Next week, Margo will post a blog about one of the characters from her book, Sanguinary. Margo Bond Collins is the author of urban fantasy, contemporary romance, and paranormal mysteries. She has published a number of novels, including Sanguinary, Taming the Country Star, Legally Undead, Waking Up Dead, and Fairy, Texas. She lives in Texas with her husband, their daughter, and several spoiled pets. Although writing fiction is her first love, she also teaches college-level English courses online. She enjoys reading romance and paranormal fiction of any genre and spends most of her free time daydreaming about heroes, monsters, cowboys, and villains, and the strong women who love them—and sometimes fight them.